While many parts of India are going through a sustained water crisis, the western city of Pune is trying to deal with the problem in a rather unusual way, writes the BBC’s Geeta Pandey. Pune Restaurant and Hoteliers’ Association president Ganesh Shetty, who owns Kalinga, told the BBC that they have worked out an extensive plan to save water. Kalinga gets about 800 customers a day and by serving only half glasses, he says the restaurant is able to save nearly 800 litres (1,691 pints) of water a day. Owner of 83-year-old Poona Guest House, Kishor Sarpotdar, shows the shorter steel tumblers he’s bought to replace the earlier taller ones. 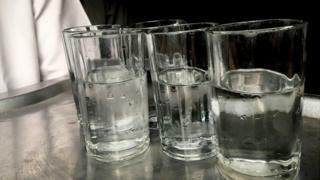 His restaurant is not only serving half glasses of water, he says, they are serving them in smaller ones too. Pune is next door to India’s financial capital, Mumbai. An educational and cultural hub, it was famously described as the “Oxford and Cambridge of India” by India’s first prime minister Jawaharlal Nehru. Strict guidelines were issued about what fresh water supplied by the civic authorities could – or couldn’t – be used for. And people were encouraged to install bore wells to pump out ground water to meet additional requirements. “It was very serious,” says Col Shashikant Dalvi, Pune-based water conservation expert. This year, he says, the situation is “worse”. “Panic buttons have been pressed in October itself. How will we face the challenge in the summer months?” he asks. According to a government report earlier this year, India is facing its worst-ever water crisis, with some 600 million people affected. The report said the crisis was “only going to get worse” in the coming years and warned that 21 cities were likely to run out of groundwater by 2020. Large parts of the western state of Maharashtra, where Pune is located, are water deficient and every year, at the onset of the summer season, the state makes the news for “water wars” between districts – farmers, villagers, city residents, slum dwellers, the hospitality industry and businesses all clamouring for their share of water. This year, that talk has already started. And it’s just the beginning of winter. Many areas are already staring at drought and acute water distress. The monsoon rains will not come before June and eight months can be a long time. “It’ll be a nightmare for the city unless we get some rains in the winter,” he says. Col Dalvi offers a prescription to deal with the water shortage in Pune and the rest of the country, because by “2025 India will be most populous country in the world”. “Leakages must be plugged, unsustainable over-extraction of ground water must stop, rooftop rain water harvesting and recycling of water must be made mandatory, otherwise shortages would get more critical,” he says.